I am excited to be among the 40 contributors from around the nation who are working to announce the forth-coming release of our book, CRISIS, by Mitchell Gold. 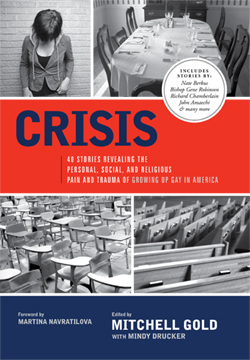 CRISIS features my story of growing up in a conservative, fundamentalist Baptist faith community and home in Winston-Salem, N.C. Proceeds from the sell of CRISIS will benefit several LGBT non-profit organizations. In addition to my story, other well-known successful members of the gay community, such as Bishop Gene Robinson, actor Richard Chamberlain, U.S. Ambassador Jim Hormel and U.S. Representatives Tammy Baldwin and Barney Frank, share what it was like to live a lie every day, without support from family, friends, church, or school — and how they triumphed over the challenges. And a number of young people detail personal experiences that make clear the same challenges unfortunately continue today. Including my contribution, CRISIS also features numerous stories and contributions from folks with North and South Carolina connections, including Brent Childers, Jimmy Creech, Mitchell Gold, Kevin Jennings, Elke Kennedy, Stephen Shoemaker and Bob Williams. This book wouldn’t have been possible without the brave and courageous voices of native Carolinians. I urge my fellow Tar Heels and Palmetto Staters to support CRISIS by buying copy, reading our stories and sharing them with your loved ones, peers, colleagues and friends. CRISIS will be published in mid-September. Pre-orders are available now. Cover price: $23.95 plus shipping and handling. Can’t wait to buy the book, Matt. Bravo! And Brandon is in it! Yuppers… There’s quite a few folks with Soulforce connections in the book, including 2007 Equality Rider Brandon Kneefel, Mel White and Dan Karslake (who made the “For the Bible Tells Me So” feature documentary).